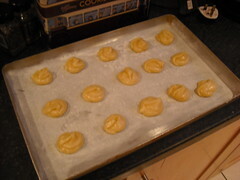 So I finally got round to making the profiteroles filled with patisserie cream as promised. It was a mistake to start baking these late on a Monday evening when my housemates had just returned from a festival and were too hung-over/exhausted to enjoy them. 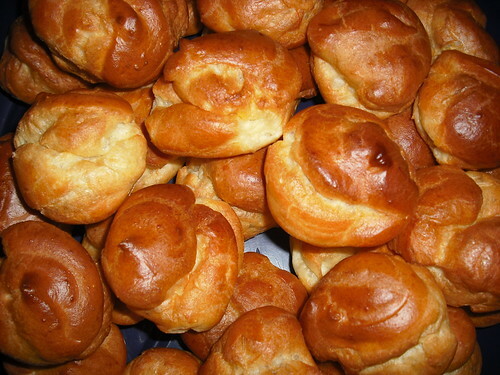 It is not possible for one person to eat 40 profiteroles, however hard they try. Attempt this recipe when you know you’ve got friends about who’ll help you eat them or freeze the unfilled profiteroles for later (the cream filling will keep for 3 days covered in the fridge). Preheat the oven to 200˚C. Pop the flour and salt into a bowl. 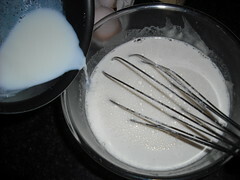 Place the milk, cold water, salt, sugar into a saucepan over a low heat. 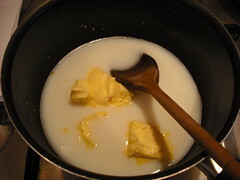 Once the sugar and salt has dissolved add the butter. Once the butter has melted, bring to the boil. Turn off the heat then tip in the flour and beat vigorously with a wooden spoon. As soon as the mixture starts to come away from the side of the pan, stop beating and tip onto a plate to cool for about a minute. 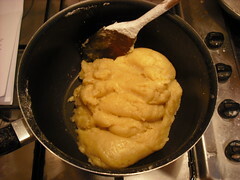 Then, slide the mixture back into the pan, then gradually beat in the eggs – mixing well – until you have a smooth paste. Most recipes tell you to bake the buns on greaseproof paper but a floured baking try worked fine. 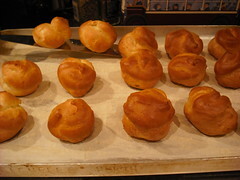 Either spoon the choux pastry into a piping bag fitted with a large plain nozzle or use a trusty spoon. Pipe (or dollop) walnut-sized blobs onto the baking tray with a couple of inches between them. Bake for 18-20 minutes until well risen and golden brown. Leave to cool. I used this recipe for patisserie cream and mixed it with 250ml of whipped cream spiked with ½ a vanilla pod and a tbsp of icing sugar. Stab a hole in the base of a profiterole and pipe in the mixture. Repeat until all the buns are filled or you get bored. 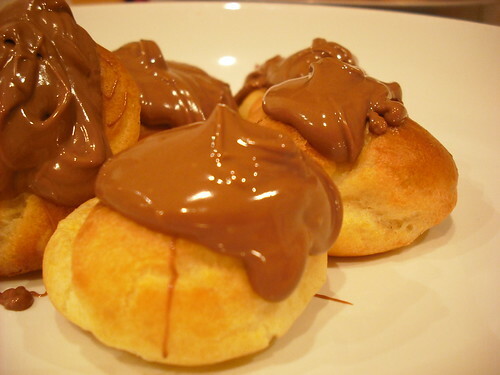 Serve the profiteroles chilled with a warm melted chocolate topping. Melt the ingredients together in a saucepan on a low heat, stirring continuously and you should be able to top about 20 profiteroles generously. Mine didn’t come out looking like this but were still pretty awesome. 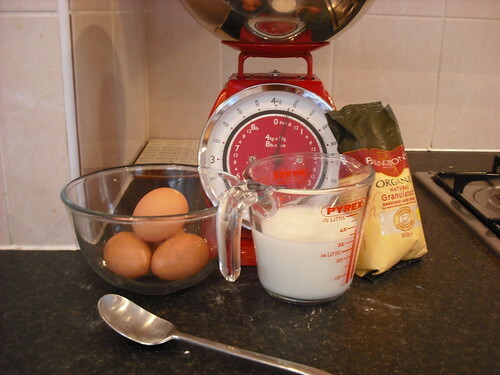 This entry was written by Rebecca Hales, posted on May 16, 2009 at 11:52 pm, filed under Recipes, Baking and tagged Baking, cakes, pastry, profiteroles. Bookmark the permalink. Follow any comments here with the RSS feed for this post. Post a comment or leave a trackback: Trackback URL. I love profiteroles more than life itself. I’ll be making these for the next party I have here.